Whether it is a pre-season celebration or an end-of-season breakup, Laser Skirmish is great for Sports Teams. At Laser Skirmish we love helping you and your team celebrate. 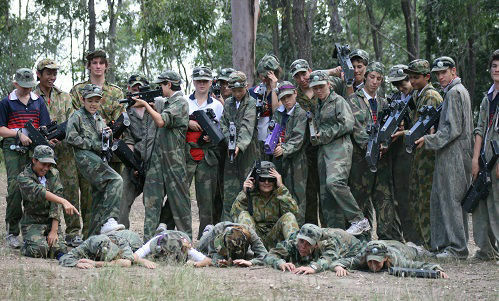 If you are the manager or Coach of a sports team then Laser Skirmish is a great choice as it is ideal for team bonding. Join one of our public sessions. Please note that all participants under 18 must ask their legal guardian to sign our Membership Form prior to play. Coaches, Managers, Parents & Grandparents who play can sign this form for themselves. "Brilliant outdoor fun away from [video] screens everyone was thoroughly and happily exhausted. Thanks ..."
"Dear Sir, On behalf of the Laidley Junior rugby League Club, I would like to thank you for showing our Under 10 boys an exciting, full filled afternoon. Their only disappointment being, that their day had to come to an end. Your organization and execution of activities is a credit to you all and our boys are eagerly looking forward to participating again. I appreciate you waiting the few extra minutes until out last player arrived. Again, thank you for hosting the Under 10's break up party. Yours sincerely,"
* Add Camouflage rental - coveralls or a shirt to wear while playing (great photo opportunity - bring your smart phone - #laserskirmish). * Participants must wear their own covered shoes. * Special Session approx 2 hour experience including a Mission Briefing, Kit Up, Organising Teams & Tactics and 4 x 15 minute games. * Coaches & Managers encouraged to join in. Click here for prices.